Each December, I like to take a moment and look back on the year that was  dive into the site’s visitor history and posts for the past 12 months and check out what was popular. As stated in years past (this is the sixth year I’ve done this sort of look back), this is a bit of a narcissistic exercise and I’m sure that no one really gets anything out of it besides myself, but I like to share how you all are using The Barley Blog. So, grab your favorite brew and let’s see what we can see. As you can see, once again I’ve been leaning heavily on beer reviews (225 at this point) as the main content driver for the site. That said, recently there’s been more local (Virginia) brewery news popping up in the likes of interviews and brewery visits. I do love doing the reviews, but my liver may enjoy the other article types a bit more. Let’s dive into those reviews a bit more than we have in the past. I’ve been a fairly regular user of the mobile app Untappd (more on this later) for keeping track of what I’ve been drinking, but I don’t review every beer that I check into the application. So I started to wonder which styles I gravitated towards in my published reviews. Well, my love for all things stout (imperial, Russian imperial, oatmeal…) has certainly been represented with 23 reviews for a variety products with the Imperial Russians taking the win at 9 reviews. And, for all of my favoritism toward the liquid black gold that I love, it didn’t stand a chance against the 35 IPAs (imperial or standard) that I reviewed in 2013. This number doesn’t account for the 5 black IPAs that I also encountered. 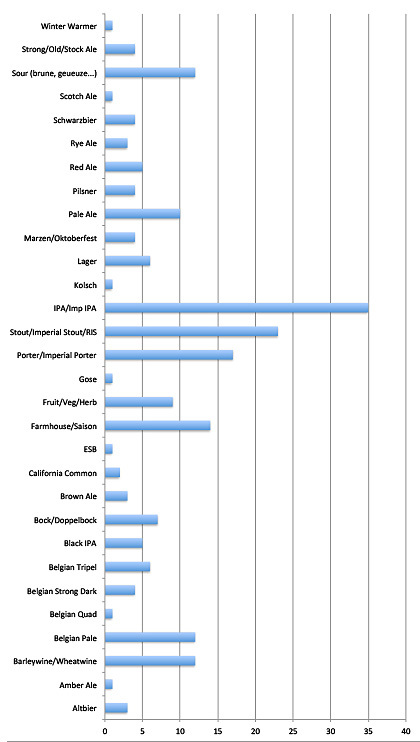 As far as some surprises in the numbers, the 14 saisons/farmhouse ales that i reviewed was a pleasant surprise. I remember having a few, but not nearly that many. Nor do I fully recall taking notes on 14 witbiers and hefeweisens  a style of beer that I am apparently more of a fan than I originally had thought. Unlike years past there wasn’t anything major done to the site’s interface or user experience. There has been some slight typographical tweaks and minor code changes, but for the most part the site has remained untouched visually. With the increased focus on local breweries I did create custom pages Maryland, Virginia and Washington D.C. Each of these pages has a fairly updated map of all known breweries as well as any recent news and reviews I’ve published for their products. And now we get to the statistics portion of our show. For the first time since The Barley Blog launched, site traffic and the number of unique visitors are down from the previous year. As of this writing 23,857 of you accounted for 29,643 visits and 47,029 pageviews. I’m not entirely sure why traffic to the site dropped nearly 34% since last year, but I don’t like it. Spending some time deep in the numbers it appears as though traffic from Google search has dropped significantly  a 49% drop to be specific. 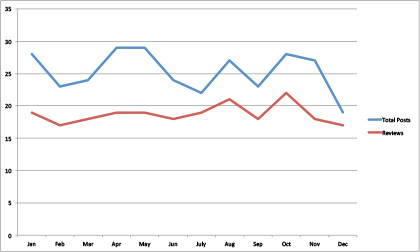 When compared to last year, those numbers are not pretty, but a bright spot to look at is “Average Duration on Site”. The average time you all spent on the site is up over 28% from last year, so there may be less of you visiting, but you’re hanging around longer. Hopefully that’s a sign that the content on the site is more inline with what you want to read. Another statistic to note here  and I’ve been seeing the trend increase over the past couple of years  is the number of visits from mobile devices (smart phones and tablets). In 2012, roughly 24% of all traffic to The Barley Blog originated from something other than the traditional desktop computer. This year, a whopping 35% of you are now visiting this site on a mobile device. That’s a heck of a jump, but not overly surprising considering the ubiquity of tablets and smartphones. I just can’t shake that damned “Blue Dog Wild Blue Lager” review. It still brings in large numbers of visitors. So there you have it. It’s been an interesting year for the site. It and you all as visitors continue to evolve as the craft beer environment also continues forward (through growing pains and all). Here’s to a great past twelve months and to looking forward taht 2014 my have in store for all of us. Cheers. Share "Barley Blog 2013 Year in Review"